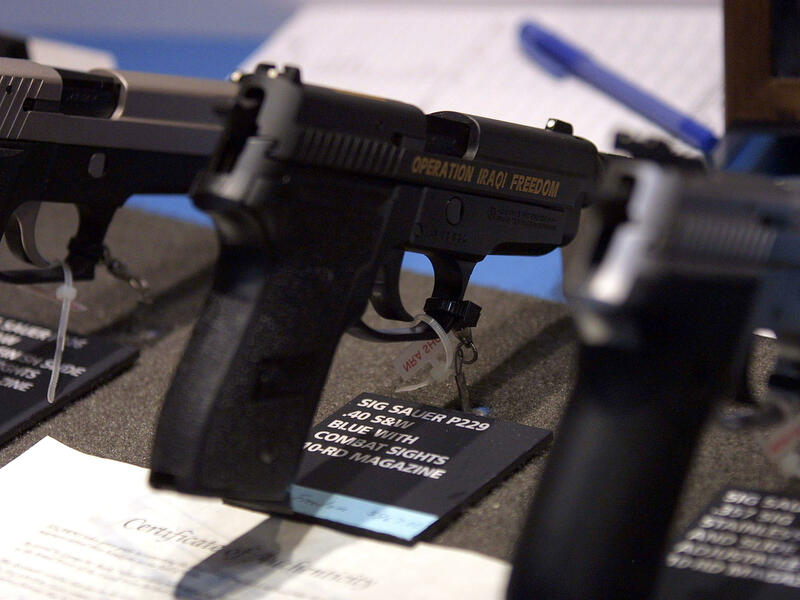 A handgun on display at the National Rifle Association's 2003 annual meeting in Orlando, Fla. A federal appeals court struck down part of a Florida law prohibiting physicians in that state from discussing guns in the home with their patients. A federal appeals court says doctors in Florida must be allowed to discuss guns with their patients, striking down portions of a Florida law that restricts what physicians can say to patients about firearm ownership. In a 10-1 decision, the full panel of the 11th U.S. Circuit Court of Appeals found that the law, known as the Privacy of Firearm Owners act, violates the First Amendment rights of doctors. A federal judge blocked the 2011 law from taking effect shortly after it was passed, and legal challenges by medical and gun control groups have been moving through the courts ever since. In 2014, a three-judge panel of the 11th circuit upheld the constitutionality of the Florida law. Thursday's ruling overturned the panel's decision, noting there's no evidence that by asking about guns, doctors were in any way infringing on the second amendment rights of their patients, NPR's Greg Allen reported. "The Florida law was passed in 2011, and targeted pediatricians who asked parents about firearms in the home. Under its provisions, doctors can be punished with a fine of up to $10,000, and can lose their medical licenses for discussing guns with patients." The decision upheld a portion of the law that explicitly prevents doctors from discriminating against patients who own guns. The National Rifle Association, which lobbied for the law's passage, has weighed in on the legal fight. As The Atlanta Journal-Constitution reported, the NRA's Institute for Legislative Action sent members a letter about the case in 2015. "Physicians interrogating and lecturing parents and children about guns is not about gun safety," the letter read. "It is a political agenda to ban guns. Parents do not take their children to physicians for a political lecture against the ownership of firearms, they go there for medical care." One of the judges in the majority, William Pryor, wrote a separate concurrence addressing gun rights arguments head on. "I write separately to reiterate that our decision is about the First Amendment, not the Second. The Second Amendment "guarantee[s] the individual right to possess and carry weapons," ... but the profound importance of the Second Amendment does not give the government license to violate the right to free speech under the First Amendment," he wrote. "The First Amendment is a counter-majoritarian bulwark against tyranny. ... The promise of free speech is that even when one holds an unpopular point of view, the state cannot stifle it. The price Americans pay for this freedom is that the rule remains unchanged regardless of who is in the majority." "If we upheld the Act, we could set a precedent for many other restrictions of potentially unpopular speech. Think of everything the government might seek to ban between doctor and patient as supposedly 'irrelevant' to the practice of medicine. Without the protection of free speech, the government might seek to ban discussion of religion between doctor and patient. The state could stop a surgeon from praying with his patient before surgery or punish a Christian doctor for asking patients if they have accepted Jesus Christ as their Lord and Savior or punish an atheist for telling his patient that religious belief is delusional. "Without the protection of free speech, the government might seek to censor political speech by doctors. The state might prevent doctors from encouraging their patients to vote in favor of universal health care or prohibit a physician from criticizing the Affordable Care Act. Some might argue that such topics are irrelevant to a particular patient's immediate medical needs, but the First Amendment ensures that doctors cannot be threatened with state punishment for speech even if it goes beyond diagnosis and treatment." An aide to Florida Gov. Rick Scott said the governor was reviewing the decision, as member station WLRN reported.